I adore these Greek Village books; there's something comforting about them that offers a very relaxing and yet compulsive read. They're about people and their interactions with others, and the two combined make me want to read on and on without pause until the story is finished. Knowing that the next book will contain the same characters and likely introduce at least one new character, or add flesh to a peripheral character from a previous book, pushes me to want to read the next.They may not be to everyone's taste, I wouldn't have thought they'd have been mine, but they are and I highly recommend them. Sara Alexi's Greek Village series just keeps getting better and better. Others have detailed the plot here, so I'll skip that and say that what I appreciate about Alexi's work--especially in The Illegal Gardner and here in The Gypsy's Dream--is how she gets inside the skin of her characters and makes them live on the page. I feel as though I know each one of them, their struggles and triumphs, their innermost thoughts. It's the rare writer who can pull that off in one book, much less in four. Read this book. You'll like it. As usual, Ms. Alexi takes us on a journey of life in the Greek Islands along with a well written story. Strong characters, vivid descriptions, and interesting story lines will keep you reading well into the night. I received The Gypsy's Dream as a free download ebook from the author. I had never read any of Ms Alexi's other books and was unsure what to expect. However, I am passionate about anything pertaining to Greece, and have read and enjoyed many other books set in Greece. Therefore, I jumped in with nothing to lose. I was not disappointed with this book. Unlike many of the previous books set in Greece that I have read, which tend to fall into the travel memoir genre, The Gypsy's Dream is a fast-moving piece of fiction. Ms Alexi's writing style is clear and economic, quickly painting a picture of her characters and situations. The drama in the story also developed quite quickly, and I soon found myself wanting to get back into the story to find out what the characters would do next.My only (small) regret was that in some ways the plot moved too quickly and I felt that the story was over too soon. The characters and location were rich enough that I felt that a little more time could have been spent getting to know them in general day-to-day scenes not directly related to the plot development. However, that is a very minor criticism and I will definitely be looking for more of Ms Alexi's books to add to my library in the future. Loved this book! It fits so well with the other books in that things that were only hinted at in other books are fleshed out in this book. 'Mysteries' that left me hanging and wondering are solved. I cannot wait to read the next book and learn more of the everyday life of the people of this small village. I lived for 6 months in the village of Atsipoupolo on the island of Crete. I find it quite easy to recognize the village and the lives of its inhabitants in Alexi's books. The characters are finely drawn and fleshed out in each book. There is a deep awareness of Greece and the current problems in the region, ie the pressures of immigrants from the Middle East, the influx of westerners, the gypsies, etc. I so enjoyed my life in Crete and these books take me back, but they also give me a greater understanding of the people and the life. Thank you, dear Sara! Loved It!!! !Discovering more about Stella was heartwarming & at times pulled at my heartstrings. I loved how the character grew & matured throughout the story. Abby was a great addition to the storyline, & as in the previous stories bringing the story together with previous characters kept me engaged & wanting to know what will happen next. I believe there is another book - I HOPE there is, I am completely captivated with these characters! The Greek Village series has fast become one of my favorite series of books to read. The author clearly paints an ever developing picture of this quaint village in Greece. Each book develops and intertwines the characters, locations and village life drama's building on a solid story line for each book. Because of the continued development of each character and their relationships with each other each book is truly a charm to read. I can't wait to pop the next book onto my Kindle and start #5. 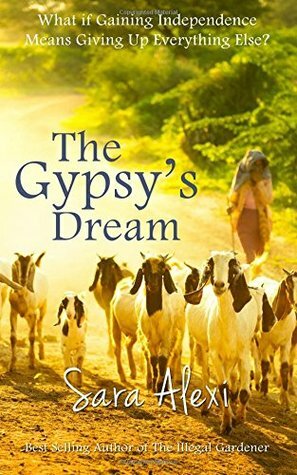 The Gypsy’s Dream – Sara Alexi 5*I’ve now read several of the Greek Village series and this one didn’t disappoint. I loved the character of Stella, and enjoyed the building of tension in the café/bar as Stella coped with the appearance of a young English girl. Dark secrets are revealed, and as always Juliet is there on hand to give some sage advice. Recommended. I really liked this book.This is a story of dreams, of strength, of life. Stella is a kind, hard working woman who has grown apart from her cruel, repulsive husband. Abby, a teenager from England 'accidently' arrives in the village and their lives become enmeshed.The novel is well written with only a couple of typos. I recommend this book whole-heartedly. A slow start, but well worth the investment of time. I am glad I persevered as this turned out to be a thoughtful and enjoyable book. The writing draws you into the local Greek culture beautifully. All of the other books in the series are on my wish list now. And other books from this worthy author. Another Great Greek Story! !It feels like I'm a part of the family. It is enjoyable watching them interact with each other. I rooted for Stella and for her bravery to leave Stavos. Each character has their own unique quality. I would recommend this book and am looking forward to the next selection. I loved the history and the scenery. Saras characters are real to life with all of lifes problems and beauty. I love to come back to hear from my friends here in the Greek Village. To know what made them who they are and to see how they are doing. I cannot wait to read the next book! Dramatic! Another brilliant "Good Greek read" and a brilliant follow on from the dynamite drama of book 3. Really enjoyed this and will start on book five very shortly! I just love this Greek Village! Whimsical coming of age storyI loved the depiction of the village and people. Abby's struggles are shaping her into a strong woman who is wise to surround herself with good people. Nice, quick read. Am so loving this series that I just want to go back to Greece and the Greeks. Think I will just try the next one.Just realised I have read the first 4 books in under 4 days. This is a wonderful book! It is very much of the moment, relevant to the current me too movement. Womens' friendship, following dreams, confronting bullies, finding joy in unexpected places are the main themes. The action is exciting, the characters is well developed, the setting is charming. Another joyful reading from Sara Alexi. Gypsies!This gripping story held my attention, finishing in 3 days. Poor editing plagued throughout the book, but I recommend it. One of the Greek village series Always lovely stories. A great tale of a lost soul who finds friends in the village. I would give this book 3.8 stars if I could. Of the Greek Village series this is the one I like second best. My favourite still being The Illegal Gardener. I like the idea of all these stories taking place in the same locale with the focus shifting from one character to another in the different 'episodes'. There is quite a bit of internal monologues going on which gives insight into the characters.The story does not demand a lot of attention and flows along at a nice pace. Characters show development, although I do find some of the characters to be somewhat naive. I also found it a little strange that a minor would be permitted to book flights and travel abroad without parental consent ever being sought.All in all I enjoyed the book and would recommend to other readers who enjoy something light to relax with. I have enjoyed each of the four books I've read in this series, so far. They are well written and immediately draw you into the life of a small Greek village. I am getting to know each of the characters and wonder who will be the focus of the next book, as I finish each one. I have a feeling that I may be sad when I reach the last from this series.This is a story that highlights prejudice and the damage it does to a person's self esteem. Stella didn't expect, or think she deserved the good things that life had to offer and settled for a loveless marriage, out of gratitude, and a life of making do.I am reading the complete series through a second time, as I enjoyed them so much the first time.I have now read this again and I got even more from it the second time around. I received this book for free through BookBub.After about three chapters, I really wasn't sure if I was going to finish this book. I took a break and read another book and came back to this one. There were twists and turns I didn't expect as the story progressed and I looked forward to finishing it to see how the crises were resolved.I believe the author did a good job of setting the scenes and describing the characters. I was able to create clear images in my mind rather easily as I read.If I can borrow the remainder of the books in this series from the local library, I will read them. I liked the characters; very real people with real reactions and worries, but not overblown. It took some time to get into the book, and I can't help but wonder if that would've been different if I'd read the others in this series first. About the time I decided I couldn't keep reading and tried to put the book aside, I got pulled back in, not by the person I originally thought would be the main character, but by the much more interesting, honest character of Stella. This was a good read, and I'll probably go back and read more of the series. I stumbled upon this book from a site that offers free books once in awhile and I loved it. I didn't know it was part of Sara Alexi's Greek Village series. I devoured it, falling in love with the characters and the village. By the time it ended I felt like I lived there and I didn't want to say goodbye to those characters I had grown to adore. I have read the first one now and it is just as good. I highly recommend this series to everyone.